With a Bourne Identity meets Dante meets Harris Tweed thriller, Dan Brown is back with a bang with his new novel, Inferno. With it we again meet the erudite Harvard symbolist Robert Langdon. 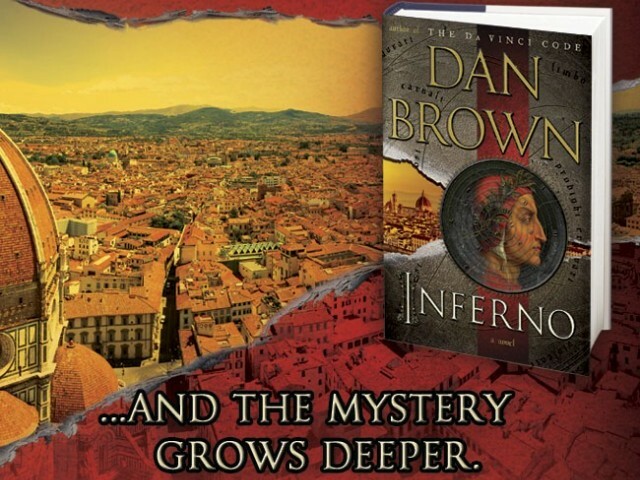 Much was speculated before Inferno hit the shelves, including whether the book would be about Da Vinci’s long lost masterpiece in Florence, but the speculations have now been laid to rest. Robert Langdon in this story finds himself in a Florence hospital with no recollection of how he got there. He only has a laser pointer that reveals renaissance artist Sandro Botticelli’s depiction of medieval literary giant, Dante Alighieri’s Inferno. This is a part of Dante’s epic poem The Divine Comedy, the other parts being, Purgatory and Paradise. Aided by the attractive 208 IQ, Sienna Brooks, and hunted by shadowy Backwater type security agency, The Consortium, Langdon is launched on a quest to discover a weapon, built by a crazy mad scientist that has the ability to depopulate the planet of human species. To find that weapon, Langdon has to race against time, solving various puzzles and codes, travel from Florence, Venice to Istanbul before it’s too late to save the planet. The novel deals with the futuristic concepts of trans-humanism – an international movement that aims to enhance human intellectual, physical and psychological abilities by using cutting edge scientific research. It delves deep into the question of overpopulation and its effects on human civilisation, while exploring the deepest recesses of the hell visualised by Dante more than 600 years ago. Although Inferno is definitely a page turner, it suffers from being a bit too formulaic. From Angels and Demons, Da Vinci Code, The Lost Symbol to Inferno, it seems that Dan Brown is following a certain pattern for the Robert Langdon series, consisting of famous art pieces, a mad genius villain on an arcane quest, beautiful but intelligent female sidekick, and a forever alone Robert Langdon. All of this actually has the effect of making the novels a bit too predictable. Although to Dan Brown’s credit, he does pull out some surprises (thus upsetting the formula he has so faithfully followed in the preceding novels), but then quickly reverts to the same setting as the novel nears its ending. I found the ending of the novel somewhat anti-climactic, considering the crescendo of revelations and surprises that he was building up towards the end. Also, the book falls into the trap of erudition in which its predecessor, The Lost Symbol fell in, thus making the pace of the story lethargic. Parts of the novel give an impression that Dan Brown is acting more like a tour guide rather than a thriller author. It seems that he is under pressure from the armies of fans and detractors alike who religiously dissect every piece of fact to either uncover some hidden knowledge or to prove that Brown is really a nut job. Thus, the author, in order to impress (apparently), tries to cram ever more information so that you got to have an encyclopaedia with you every time while you are reading the book. Compared to The Lost Symbol, this book is less lethargic, but unfortunately nowhere near the genius of Da Vinci Code, Angels and Demons, Deception Point and Digital Fortress. That does not mean that Inferno doesn’t make up for a good read. The novel might make up for a summer blockbuster, but that, so far is undecided. Moreover, it seems that Dante’s Divine Comedy will enjoy a brief resurgence in readership amongst the younger audience before slowly fading back to relative obscurity. Despite some factual errors and a slow moving narrative, Inferno nonetheless is a highly interesting read, and towards the conclusion, the novel is un-put-down-able. Inferno definitely deserves a place in your bookshelf. Just THREE comments on a book? Angels and Demons is the best by far! Dan brown iseems to have fallen in a rut of his own creation. I have read most of his books. U read one u have read em all.